The goal of the AGvisor program is to assist Farm Bureau members who would like to learn a specific skill/area of skills to create a successful leader in the agriculture industry in New Hampshire. 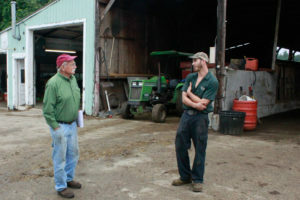 The AGvisor program is a beneficial program to the members of New Hampshire Farm Bureau as it is a cost-free mentorship program that runs for a 3-month period during which an experienced mentor will be proving helpful knowledge. The AGvisors will have the opportunity to share their experience and expertise with the AGvisee, helping them through the program. This program will provide the AGvisee (mentee) an opportunity to learn skills and knowledge from experienced AGvisors (mentors), all while having the common ground of being members of the New Hampshire Farm Bureau.